Washington, March 26: Days after the space agency announced making a historic move, the US space agency NASA (National Aeronautics and Space Administration) on Monday scrapped its plans to perform the first all-women spacewalk. The plan was called off due to lack of available spacesuits that would fit them at the ISS (International Space Station). Astronaut Christina Koch will now perform the skywalk with male-counterpart Nick Hague instead of Anne McClain. Moon Could be a Chemical Factory for Water: NASA. If Koch and McClain would have done the spacewalk together, it would have been the first by all female crew. As a part of Expedition 59, Koch and McClain were set to work outside ISS on March 29 to install the lithium-ion batteries in one of the station's solar arrays. NASA Mission Could Now Find More Than 1,000 Planets. "After consulting with McClain and Hague following the first spacewalk, mission managers decided to adjust the assignments, due in part to spacesuit availability on the station. McClain learned during her first spacewalk that a medium-size hard upper torso – essentially the shirt of the spacesuit – fits her best. Because only one medium-size torso can be made ready by Friday, March 29, Koch will wear it, " said NASA in a statement. 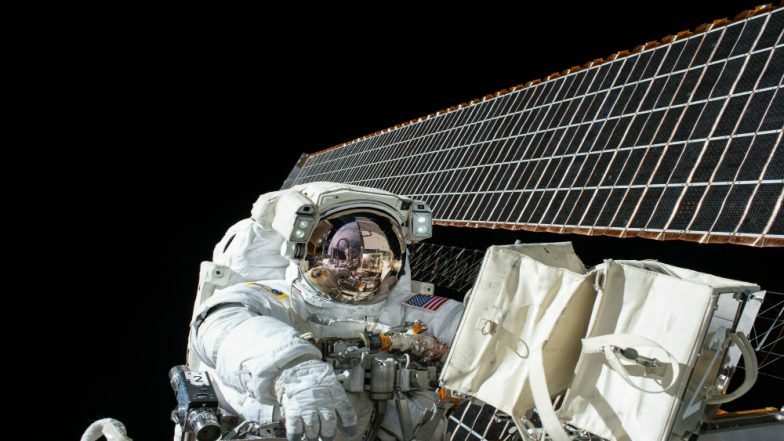 According to NASA, spacewalks are done for a number of reasons, including to test new equipment in space, doing repair work outside spacecraft as well as conducting science experiments. Typically, spacewalks last between five to eight hours but the time can be extended as per requirement.